As human rights defenders, our analysis of developments in our society or indeed internationally often leads us to identify problems with regard to respect for Human Rights. We must then consider what is our vision for change? For many human rights defenders, this will already be clear, but sometimes we don't take the time to clearly articulate and define our vision or goals. Being conscious about this process is helpful when creating a strategy, which in turn informs the decisions we make regarding our security: our vision and goals, and how we set out to achieve them, determine what other actors in society will act to help or hinder our work, and therefore impact our security situation. Thinking critically about our strategy becomes even more important when working in groups. Being transparent and open about the changes we want to achieve and how can prevent difficulties and conflict within the group but also within our community or society in general. What is the problem, or the problems, that you hope to address? What change do you wish to see? How would your community be different afterwards? What would be different about the relationships between people if you succeed? Who are the other individuals, groups, institutions, etc. involved in this issue and how do they react to your activities? When we have a clear vision of what we want to achieve, we can start thinking about the 'how'. What methods and activities should we implement to achieve our goals? Which of these are we doing already? What else could we be doing? Which activities are perhaps not as effective in achieving our goals as we previously thought? if necessary, make time in a group to reflect critically on this. The activities we carry out, and our behaviour while we carry them out, define how we are perceived by State, society and others around us. How we 'interface' with these actors will determine their response to us, and influence the extent to which they tolerate, accept, or reject our work and attempt to close our space for it. Therefore, it is valuable to get a clear picture of all the actors in our environment (individuals, institutions, organisations, etc). Threats almost always come from someone or something. Knowing as much as we can about the actors in our context improves our perception of our environment and thereby, our ability to carry out activities to maintain or expand our space for work. Some of these actors can be viewed as friends or allies, others as opponents, and still others will sit somewhere in the middle, as neutral parties. Each will have their own interests and resources at their disposal, and can potentially help or hinder our work. Your security plan will benefit from understanding who these actors are and how their actions affect you. Try completing this exercise to map the actors in your own field and the nature of their relationship to you. Allies: these are actors with strategic alignment to our goals, though the strength and longevity of their support may change over time. Adversaries or opponents: these are actors whose strategic interests are opposed to ours, or somehow oppose our goals for various reasons. Again, remember that the intensity of opposition or disengagement may vary with changing circumstances. Neutral parties: these are actors who neither support nor oppose our cause. However, their role may change depending on the changing situation. 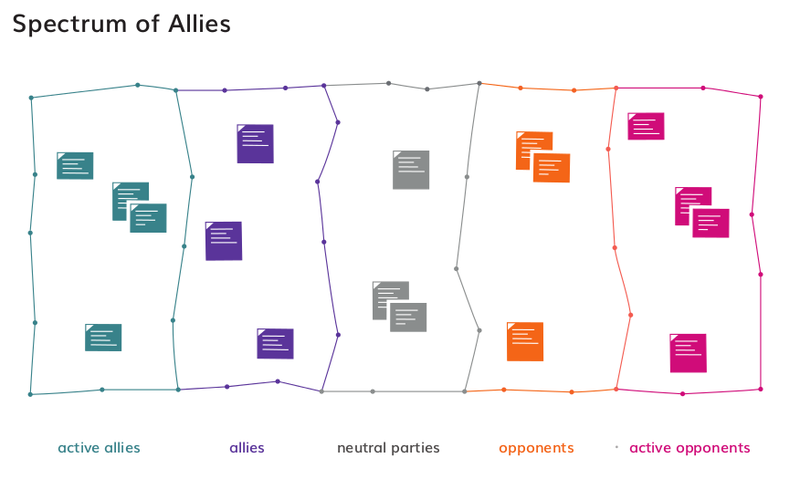 This 'spectrum of allies'1 is often used in action campaign design, to identify those we want to influence. 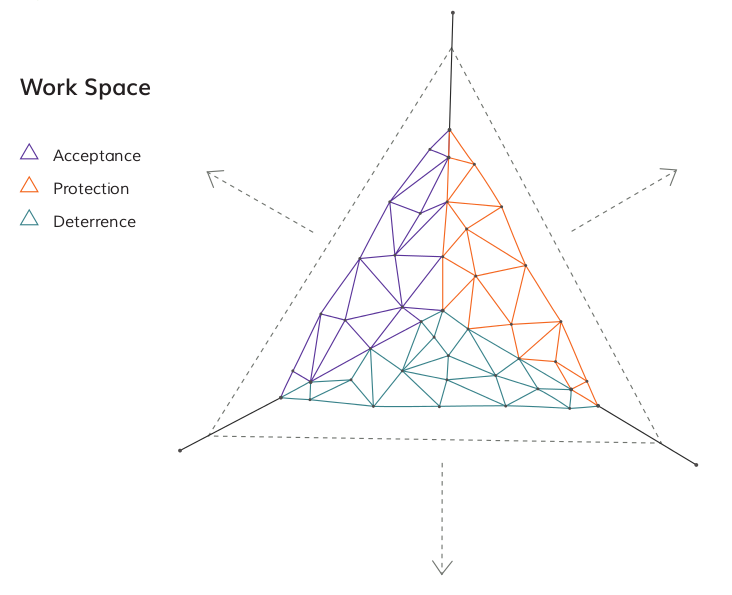 We can also use this spectrum for security planning and promoting acceptance of our work among different elements of State and society – that is, through different kinds of advocacy and engagement. In order to prioritise, you might firstly focus on the active allies and opponents in your context, and dig a little deeper into their motivations and resources. This is useful when you are analysing potential (or actual) threats, and who is actively or inadvertently behind them. Then, in mapping the relationships between the actors around you, you may see avenues which can be used in order to improve your relationship with your opponents (for example, through mutual contacts). The next step is to analyse, identify and specify the nature of relationships between actors. This is particularly useful for identifying actors whose motivations may lead them to threaten us or our work, as well as allies who can be relied upon to help us work more securely. To do this, try the following exercise. It is a good idea to store actor maps where they can be viewed and updated on a regular basis: while at first you may do it visually, you can later create a digital document such as a spreadsheet wherein you can keep up to date information sheets on the key actors identified in your map. This will be useful when considering your security strategy and new threats as they emerge. Guidance on what details might be useful to include is listed at the end of the second exercise. Having established a good understanding of our socio-political environment, we should now take account of what our data and information mean for our work and our security.